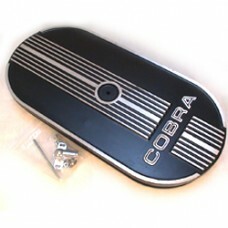 Ford Racing produce this air cleaner to complement the COBRA Powered By Ford valve covers (script is slightly different to the valve covers FMSM6582A). This Ford Racing air cleaner is no cheap imitation. Die-cast aluminium and features black crinkle finish with satin polished raised detail. Fits single 5 1/8” neck carburettors e.g. Edelbrock Performer Series, Holley. As this air cleaner sits above the carburettor rather than recessed around e.g. EDEL1207, bonnet clearance may not be adequate. This item is pre-order only, contact us for availability and pricing.